Preheat oven to 375. Oil a 2-quart or 9 x 13 glass baking dish. I used coconut oil and let it melt in the dish while the oven was preheating. Add rinsed and drained black beans to a large bowl. Using a fork, roughly mash about half of the beans. 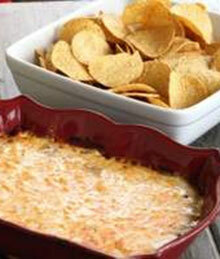 Add remaining ingredients to the bowl, using just 1/2 cup of the cheddar cheese and stir to get everything well-mixed. Pour the mixture into the baking dish and top with the remaining 2 cups of cheddar cheese. Top with Jalapenos and green onion if desired. Bake at 375 for 20-25 minutes, until hot and bubbly. You can prep this black bean dip ahead of time and keep it in the refrigerator, covered, until you’re ready to bake it. Take it out as you preheat the oven, so it comes up to room temperature a bit, and add 5-10 minutes to the baking time.